The construction of the venue of the 17th FINA World Championships’ High Diving competitions has already started in December 2016. 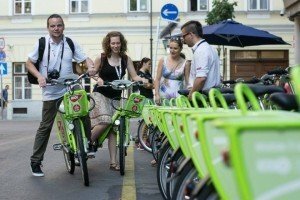 The works will have minimal inconvenience for the public transportation on the Buda side of the capital. The FINA World Championships will be one of a kind, a sparkling spectacle in the heat of the summer, the High Diving competitions are scheduled between July 28 and 30. The discipline of High Diving, inspired by traditional cliff diving was first included in the competition programme at the FINA World Championships in Barcelona back in 2013. During the contest men dive in from 27 meters high, while women do from 20 meters. To where exactly, that strictly depends on the Organisers and the available natural resources and facilities. The athletes dived into natural water in Barcelona and Kazan, however in Budapest they will jump into a temporary 6-meter-deep round shaped soft pool which will be specifically built for the World Championships. 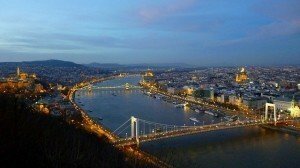 The competition will take place right in front of the Hungarian Parliament, which will let the audience experience a lavish view unfolding in front of their eyes through the TV broadcasting and on the spot at the grandstand set up on the upper embankment of River Danube – it will feel like the divers are jumping directly into the river. 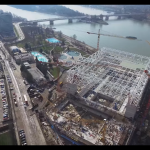 According to the Hungarian National Asset Management Inc., during the first phase of the project, the reinforced concrete platform, the basic edifice will be finished, the construction will be finished by the end of April 2017. To create this platform, which has 17×47 meter floor area, they will use 315 m3 concrete and 125 tons of reinforced concrete. The foundation will be formed into the river bed of the Danube, building it from an anchored boat on the river. The 33-meter-tall and 10-tons-weigh tower and the pool will be placed right after finishing the platform, the placement of the tents and containers necessary for the event will follow afterwards. 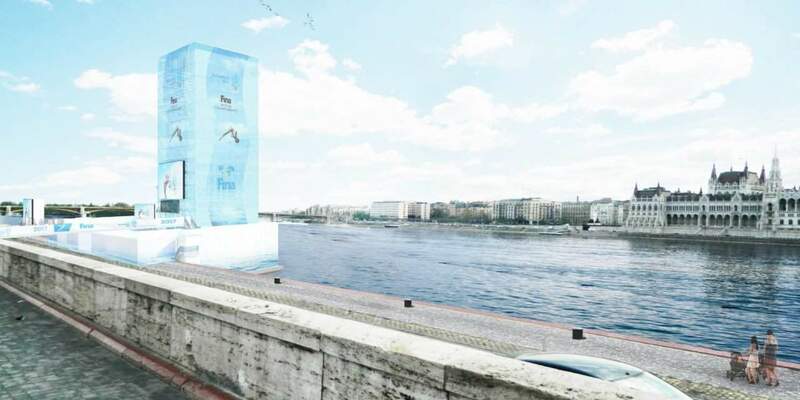 The temporary grandstands, the FINA Competition Office and the Press Room will be established at the upper embankment, the building will start early in June. 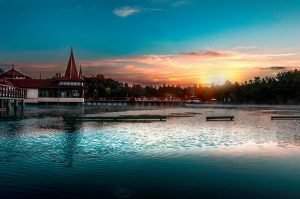 The training of the High Diving is set to start from the 25th of July, various parts of the project will be handed over scheduled till then. As the Hungarian National Asset Management Inc confirmed, solving the traffic management was a main viewpoint during the project planning. The affected areas will be partially or completely shut down in the worst-case scenario for the shortest time possible. The expected closures, diversions will be announced by the implementer according to the schedule of the investments. The diving tower, the grandstands, the pool and other event-related facilities will be demolished, dismantled after the World Championships. 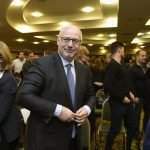 However, since Budapest will organise the European Aquatics Championship in 2020, it seems appropriate to retain the platform due to professional and economic reasons if High Diving will be included in the competition programme. The 17th FINA World Championships’ High Diving events are scheduled between the July 28 and 30. Detailed schedule and tickets are available on the eventim.hu website!